Thanks to Diplopundit for pointing out U.S. Embassy Kabul's announcement of the State Department's newest property acquisition in Mazar-e-Sharif. The announcement made the property sound nice, "the historic Mazar Hotel owned by the Ministry of Information, Culture, Sports and Tourism," but caveat emptor, as a realtor might say. 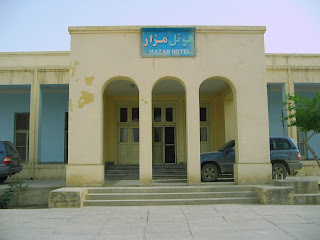 The Mazar Hotel is a bit of a fixer-upper, but $26 million in U.S. taxpayer's money ought to do wonders for the place. The hotel's pool is a big selling point. Full disclosure: the pool has no filter or purification system, so the water has to be changed every few days. Thanks for the link TSB! Glad to see the pictures. 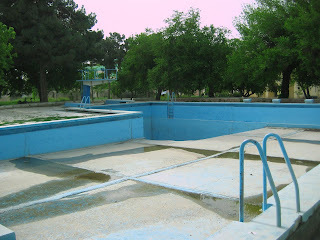 The pool has no filter - eww, I wonder how often that water was really changed. Next Year in Jerusalem? Unlikely.